Contact B L MicroTek Ltd Mobile Computer Services now! 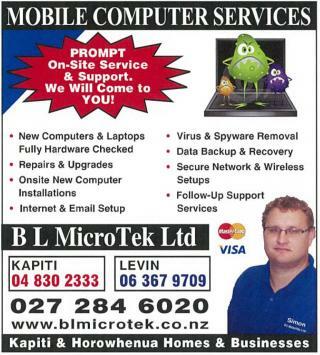 WELCOME TO B L MICROTEK COMPUTERS LEVIN Computer Repairs and Upgrades - "I will Come To You" B L MicroTek Ltd offers Computer Support to Local Businesses and Home Users throughout the Levin, Kapiti and Manawatu Areas. IS YOUR COMPUTER/PC RUNNING SLOWLY? OUR SUPPORT SERVICES INCLUDE: # New PC Computer Sales for Home, Business or Office Desktop or Notebooks # Desktop Computers and Laptop / Notebook upgrades # Desktop and Laptop / Notebook Computers Sales and Parts # Computer System Service and Upgrades # Computer Hardware and Software for Sale # Virus Removal and System Cleanups # Computer help & support is available at all times from our resident computer geek At BL MicroTek we offer our customers computers and notebooks based on your needs and our friendly advice. All our Laptops and Desktops are Verified and Supported by the Support team at BLMicroTek. This is also backed up our 24 hour Online free service request form and our product guarantees. Computer and notebook / laptop upgrades, repairs and support can be undertaken both Onsite and Inhouse for all our customers what ever their needs maybe! PROMPT Onsite Service and Support We Come to YOU!. With all this in mind we offer a broad range of IT Services including setup of dialup, ADSL Board Band internet, e-mail and domain name services to different internet providers also setup and installation of Networks and Wireless Networks, Data Recovery and Backup, Software and Printers, setup of 3G mobile data networks via Vodafone and Telecom just to name a few We have a wide range of Information Technology Products including Lenovo and ASUS range of Tablets, Laptops and Desktop computers, Logitech Web Camera’s, keyboards / mouse and speakers, ViewSonic LCD Monitors, Netgear and D-link Network Products, Transcend, Seagate and Western Digital both internal and external Hard Drive devices and many more associated technology products which can be seen via our links page on our website. We can also offer Finance via FlexiRent to help you get up and running with the latest technology around!